FORT COLLINS Roger Mondragon visited the ER 22 times in two years, but still felt lousy and neglected. It was the only place I knew to go, said Mondragon, 22. When Im in pain, Im stressed. Im frustrated and angry. Developmentally delayed and suffering from several ailments including kidney disease, severe back pain, migraines and respiratory problems, Mondragon used to dial an ambulance whenever his anxiety or pain escalated. In a single month, he says he called an ambulance eight times. Born with a fractured disk and severe asthma, Mondragon spent the first few months of his life in the hospital, then experienced what he describes as a miserable childhood. At 17, he had back surgery that left him with rods in his back and excruciating pain. Mondragon works at a center for the developmentally disabled. He likes his job, except when his medications make him sleepy. We put tags on sunglasses, Mondragon said. He also helps pack kits so people can create clay impressions of their pets paws. We put clay things in bags. If your pet dies, then you have a memory. An assessment at the center where he works also found hes on the autism spectrum. I looked it up. It fits who I am. There are times when I dont talk for three or four days. Mondragon now lives with an aunt. He has been on Medicaid for much of his life, so taxpayers fund his health care costs. In recent years, Mondragon visited Poudre Valley Hospital so often that ER doctors red-flagged him. Mondragon dresses neatly in business attire, walks fast and looks relatively healthy. At first glance, he could be mistaken for a young medical student. He says nurses and doctors at the hospital ER didnt believe he was sick or in pain; they suspected he was just shopping for attention or pain pills. I felt like my rights were being violated. They werent doing their jobs as doctors because they werent treating me. I yelled at them. I didnt think I was getting treated right. They would get quiet and walk away from me and told me not to come back, Mondragon said. Then everything changed almost overnight last April when Mondragon became one of the first patients in an accountable care program that aims to revolutionize Medicaid in Colorado. The new initiative could be one of the keys to Gov. John Hickenloopers plan to cut Medicaid costs while simultaneously adding about 160,000 new low-income patients. Earlier this month, Hickenlooper announced that Colorado plans to expand Medicaid. The governor projected that Medicaid expansion would cost $128 million over 10 years, but vowed to save as much as $280 million through cuts and more efficient care. Along with trimming costs, accountable care programs like the one Mondragon is part of also aim to help patients become healthier and more productive. Mondragon agreed to share his story and his medical experiences to illustrate how accountable care works. Last spring, an attentive care coordinator named Sarah Bryson reached out to Mondragon and asked if he wanted to participate in the Fort Collins Medicaid Accountable Care Collaborative (MACC). The Fort Collins program is part of a statewide effort that sounds counterintuitive: give complex Medicaid clients more care to save money. Bryson had found Mondragon through her groups own data review and also after a referral from a Poudre Valley hospital team that flagged his frequent visits. Mondragon agreed to participate and now Bryson meets him for monthly visits with a primary care doctor, coordinates his visits to specialists and serves as his advocate and sounding board. When hes feeling sick or anxious, he can call Brysons mobile number instead of an ambulance or ER nurse. Then Bryson or a colleague who is well acquainted with Mondragons medical history can figure out what kind of help he needs. As a result, Mondragon has only visited the ER twice since last April. Once, he left before being seen. The other time, he carefully pondered whether his choices and providers thought the visit was necessary. 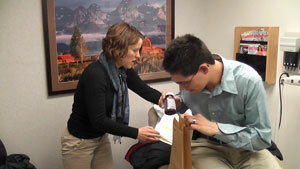 Dr. Liz Banowetz, left, and care coordinator, Sarah Bryson, discuss medication with patient, Roger Mondragon. its nice to have someone who understands me, said Mondragon. Im a lot cheaper than a doctor and the ER, said Bryson, who is a licensed clinical social worker with special training in mental health and substance abuse. Its a less expensive type of care that in the end is hopefully going to save a lot of money. We help navigate the system and make sure everybody is on the same page. Bryson said that some people who have been raised in poverty dont know anywhere else to turn for health care aside from hospital emergency departments. Dialing an ambulance or going straight to the hospital can be a cultural reflex. For Mondragon, memory problems mean he sometimes cant recall all his medications. Before he had Brysons help, he said he also used to miss a lot of appointments because he simply didnt remember them. Often his medical records fail to follow him from specialists to his primary care doctors. Even when Bryson takes time to fax paperwork from place to place, records sometimes seem to vaporize. By attending appointments with Mondragon, she can fill in holes. She tries to simplify systems that are inherently complex. We have a long way to go. Care coordinator is a new term. People get confused, said Bryson. And helping the most complicated patients will take time. A lot of people I get referrals for are having behavioral health and substance problems. If youve been doing this (abusing drugs or alcohol) for 30 years, it may take a while to change, Bryson said. Its not like I go in and do a quick fix. Even with Brysons help, Mondragon still has trouble sometimes with the medical system. He cant drive and mostly takes the bus. Sometimes Medicaid pays for cabs to get him to appointments. And sometimes the cabs dont show up. Even with Bryson meeting him for appointments, occasionally he has had specialists refuse to see him because they dont think he has a proper referral. Communication is bad, said Bryson. Nonetheless Mondragon has made dramatic progress. He even wrote a letter to the hospital committee that red-flagged him, letting them know how well hes doing and asking them to remove the marks against him on his hospital record. Im a lot better than I was. When I didnt have Sarah, I was causing more trouble, Mondragon said. He now has a girlfriend and is participating in some sports. He won a gold medal on a Special Olympics softball team and enjoys martial arts when his back is not bothering him. He loves tinkering with cell phones and his dream job would be to work for AT&T. Its nice to have someone who understands me, Mondragon said of Bryson and hisprimary care physician, Dr. Liz Banowetz, a resident in Poudre Valleys family medicine program who practices at the hospitals Family Medicine Center. Mondragon said caregivers and people in general often dont understand that he has special needs. The way Im dressed, it doesnt look like I have a disability. People sometimes laugh at me. It hurts my feelings. Banowetz, in turn, appreciates Brysons help keeping Mondragon well and on track. He seems less anxious, said Banowetz. Having Sarah makes a big difference. Roger has a lot of different medical problems that require different specialists. She helps make the appointments and follow up. It helps me because I can provide better care. She also helps reassure him. I think thats what he was using the ER for before. He was trying to get reassurance that what he was feeling was normal. Banowetz believes the accountable care model is promising and that help from care coordinators is essential. It helps the provider feel less frustration with patients who they are seeing over and over who arent getting better. The patients also seem to like it better. They have better access to care providers. And they feel they have their own personal helper who can talk to them. Bryson for her part feels shes doing her job if shes making the health care system work better for Mondragon. Like all of us, he wants to be heard, Bryson said. Since launching late in 2011, the Fort Collins MACC has been targeting the most costly 5 to 6 percent of the regions 4,000 Medicaid patients. Many have chronic medical conditions along with mental health problems or addictions. So far, the MACC team in Fort Collins has worked with about 130 adults and is in the process of launching a similar effort to coordinate care for children. Rocky Mountain Health Plans runs the accountable care programs in northern and western Colorado, one of seven regions around the state. Early data from the relatively new program shows that costs for clients in Rocky Mountains region are running about 3 percent lower per capita than costs for Medicaid patients who dont receive services like the MACC team provides, according to Nicole Konkoly, who coordinates accountable care programs for Rocky Mountain. Mondragons dramatic turnaround may be better than most. Its difficult to calculate exactly how much Bryson and the team have saved, but each of his previous ER visits cost at least $1,000 plus hundreds more for each ambulance ride. Sarah hasdone someexemplary workwith Roger, part of which wasto educate him on appropriate usage of the Emergency Department (ED), said Stephen Thompson, supervisor of the Fort Collins MACC. We have been able to demonstrate significant cost reduction for this one clientthrough markedlydecreased utilization of the ED and ambulance services alone. A statewide study of the first year found cost savings of $20 million, but found that ER use stayed the same with a .2 increase for patients enrolled in accountable care programs and a 1.5 percent increase for other Medicaid patients. Even so, policymakers from the governor to care coordinators on the ground believe the concept offers great potential. Its a pretty innovative model. Every region is doing things a little differently. As HCPF (Department of Health Care Policy and Financing) rolled this out, they tried to give communities a lot of say, said Thompson. In Fort Collins, the team decided to work with three of the largest primary care clinics that already serve Medicaid patients. The one where Mondragon gets his care is a residency training program for new family physicians that is part of the University of Colorado Health that now manages Poudre Valley. The providers get paid to keep patients healthier rather than for each appointment the concept of putting value over volume. Doctors receive a per-member-per-month fee rather than a fee-for-service payment and can choose how best to care for patients. For Mondragon, monthly tune-ups and access to an urgent care clinic if he needs it seem to be working best. In other cases, providers can set up different care plans. Overall Thompson says doctors like Banowetz have appreciated the help of care coordinators with their most challenging patients. Sometimes its harder to sell the concept to patients who dont understand what a care coordinator is, much less how joining the MACC would help them. The MACC team members comb the data to find people they know would benefit. If we see 25 trips to the ER, uncontrolled diabetes and congestive heart failure, its apparent that that persons health management is not optimal, Thompson said. Team members have tried cold-calling potential patients, but that hasnt worked well. People tend to be guarded, said Thompson. They say, I really dont know. How did you get my name? MACC managers in Fort Collins have had better luck when a doctor whom the patient trusts suggests that they participate in the program. Theres a shift from reactive medicine where we wait so long (to help) until a person gets so sick that they are admitted to the hospital. Thats the most expensive medicine a person can get. What can we do to promote wellnessand ultimately keep them out of the ER and hospitals? Thompson said. Patients respond best, said Thompson and Bryson, when a care coordinator starts with the simplest of questions: Tell me your story.